Take a short sightseeing tour of Ålesund city, passing the town of Spjelkavik en route to Sjøholt village. From Sjøholt, you’ll follow the shoreline of Storfjord, enjoying beautiful scenes from the road. You are now in an area known for both salmon fishing and furniture making. The furniture crafted here is exported all over the world. In Stordal alone there are several furniture factories. Pass the old, octagonal Stordal Church (1789). Continue to Liabygd and Valldal, renowned for growing sweet strawberries. From here, you will follow the valley towards Trollstigen (the Troll Path), passing the impressive Gudbrandsjuvet Gorge. On top of the mountain you can still see signs of the old road built in 1028 by Viking King Olav. In the center of the Trolltindene mountain range you will stop for a typical Norwegian buffet lunch of hot and cold dishes, desserts and coffee. One bottle of mineral water or light beer is included per person. 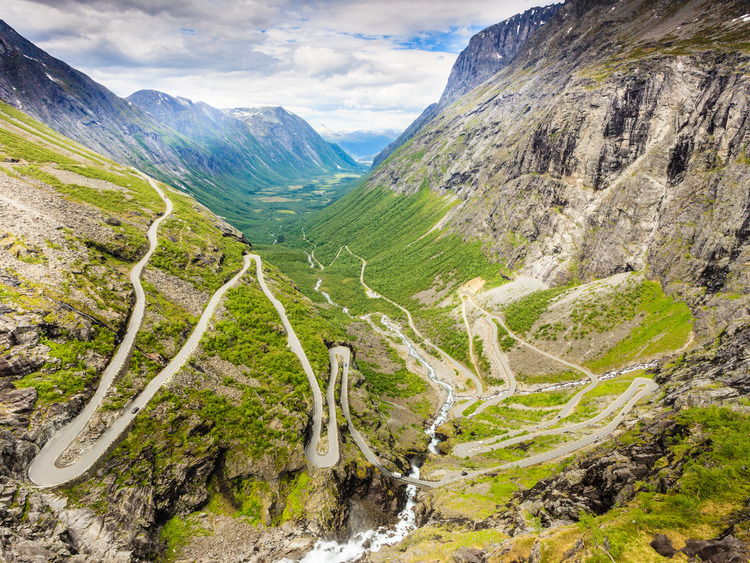 From the highest point on the road, at 2,800 feet above sea level, you will drive the famous Troll Path with its 11 exciting hairpin bends down to Isterdalen Valley. You stop to visit the famous Troll Wall—well known to mountaineers all over the world. This wall has the highest overhang in Europe and is visited by world-famous climbers every summer. Pass Romsdalsfjord and the picturesque villages of Innfjorden, Mandalen, Vagstrand and Vikebukt before crossing Orskog Mountain to join the main road back to Ålesund.